HONOLULU – The Hawaii Department of Transportation (HDOT) Highways Division is announcing upcoming cost effective and time saving operational improvements as part of its Beat the School Jam (BTSJ) campaign. The BTSJ campaign is organized annually as more than 53,000 public school, private school and university students return to class and Hawaii’s roads. This year as part of BTSJ, HDOT is highlighting current and future projects designed to maximize available highways funds while providing time saving relief from traffic congestion. The resurfacing project on Kahekili Highway added an additional Kahuku-bound lane between Haiku Road and West Hui Iwa Street which is available for use now. Equipment for a southbound (Honolulu bound) contraflow lane during peak morning traffic hours will be installed with contraflow operations expected to begin in September. The cost of the improvement project is $4 million. In June HDOT began night work on the Moanalua Freeway westbound from the Halawa off-ramp to the Aiea Pedestrian Overpass on the H-1 Freeway. The night work to reconstruct the pavement in the area and add a new westbound lane through restriping is anticipated to be complete in October at a cost of $4 million. This project will include pavement rehabilitation along the H-1 Freeway eastbound and westbound corridors from the Waimalu Viaduct to the vicinity of Halawa. The areas with an asphalt concrete overlay will be removed and replaced with a smooth concrete surface. In addition, the project will include widening of the eastbound shoulder lane between the Waimalu Viaduct and the Aiea Pedestrian Overpass to provide ample space for incident response beyond the existing shoulder lane. The widened shoulder may be used as an additional lane in the future. Construction is scheduled to start in the early 2018 with the pavement portion completed in Fall 2018. The total project cost is estimated between $60 million to $80 million. This restriping project is converting the existing two-lane highway from Keaau-Pahoa Bypass Road to Shower Drive to a four-lane highway with five-foot mixed use shoulders. Estimated completion for the $1.5 million project is late 2017. This project will provide safety improvements to the Leeward corridor in Nanakuli and congestion relief for motorists by providing a dedicated left turn lane, which allows those vehicles continuing straight to proceed without delay. Thermal camera sensors have been installed to the intersections to detect waiting vehicles. Closed-circuit television (CCTV) will be added to monitor traffic conditions. Fiber connectivity will allow active management from the future Joint Traffic Management Center (JTMC). The estimated completion date for the $10 million Farrington Intersection Improvements project is the end of this year. HDOT is looking at all possibilities for adding capacity to this heavily used corridor and is considering extension of the associated Nanakuli Contraflow to Hakimo Road. The first of the Pali Highway improvement projects will replace the street lights from Vineyard Boulevard to Kamehameha Highway (Castle Junction) and will also include repaving of Pali Highway from Waokanaka Street to Kamehameha Highway including, the parallel Waokanaka Street and the Pali Highway/Waokanaka Street intersection. This first phase of the project is anticipated to begin in Fall 2017 and end in Summer 2019. HDOT is coordinating with the City and County of Honolulu regarding its sewer line project improvements along the Pali Highway. HDOT will repurpose the median on parts of this stretch of Pali Highway in order to maintain the three current Honolulu-bound highway lanes for rush hour traffic during construction. More information is available at palisewer.org. This project will resurface Kalihi Street from Nimitz Highway to School Street and improve drainage in the area. It also includes school improvement plans to install traffic signal conduits and pull boxes for a future traffic signal at Kaumualii Street to regulate left turns into Kalakaua Middle School. 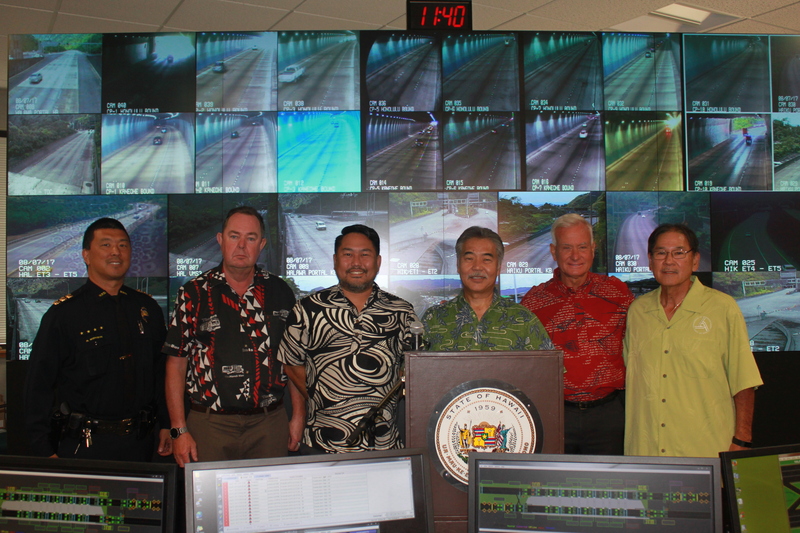 HDOT will be modernizing traffic signal systems at select intersections on Kauai and Maui to allow connectivity between signals and to set the system up for closed-circuit television (CCTV) access to HDOT baseyards. New striping is being installed on HDOT roadways throughout the state that utilizes better technology and longer lasting materials. The new thermal plastic lines include thermoplastic buttons within the line. The markings last six times longer than the reflective buttons. New lines have already been installed on portions of the H-1 Freeway, with remaining portions to be completed this year. HDOT plans to add the lines on the H-2 and H-3 Freeways and neighbor island roadways. The maintenance plan is to restripe each island every five years. HDOT is replacing existing Dynamic Message Signs (DMS) on the H-1 Freeway westbound past the Radford Drive Overpass and on H-201 Moanalua Freeway westbound at Puuloa. Two brand new DMS will be added at the H-1 eastbound in Waikele at the Paiwa Street On-ramp and on the H-1 eastbound before the Vineyard Boulevard Off-ramp. HDOT believes the projects listed above will help to improve the quality of life for users of Hawaii roadways and thanks the public for their patience as we continue to balance the needs of the system with available resources. •	Implementation of the Farrington Highway Contraflow to add an additional lane on Farrington Highway between Piliokahi Avenue to the vicinity of Nanaikeola Street during peak afternoon traffic. HDOT will suspend construction-related road closures on major state highways from Aug. 21 – 25 between the hours of 6 a.m. to 8 p.m. to alleviate congestion and help people transition into the new school year. During the daytime construction break, emergency closures, nighttime construction and roadwork that does not involve lane closures may still be scheduled. The Beat the School Jam campaign includes radio commercials that will air during the morning and evening commutes reminding people to plan ahead, adjust commute times, consider carpooling or public transportation and watch out for children walking or biking to school. Most importantly, drive smart and safe. As always, HDOT encourages drivers to plan ahead by using free resources like the GoAkamai.org website and app which provide up to the minute traffic conditions. It also has MyGoAkamai, which is a free personalized alerting service to your specific route with freeway alerts such as accidents, construction or other lane closure information. Whether traveling a short distance or across the island, people should check conditions before every trip to plan the best route.